We know what you’re thinking: what would happen if a leprechaun suddenly found himself in Ancient Egypt? Wonder no more friend – Play n’ Go have painted a pretty vivid picture in this comical slot game. The mischievous fellow has used his (lucky) charms to work magic on Cleopatra, drink Guinness with a mummy and paint the pyramids bright green in homage to his homeland. Now this Irish chap has set his sights on his next goal: helping you to win plenty of cash as part of his Egyptian adventure. 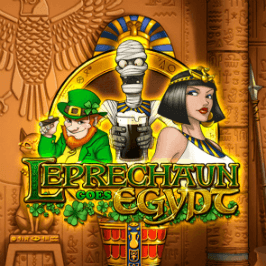 Play Leprechaun Goes Egypt Slot Demo for Free! 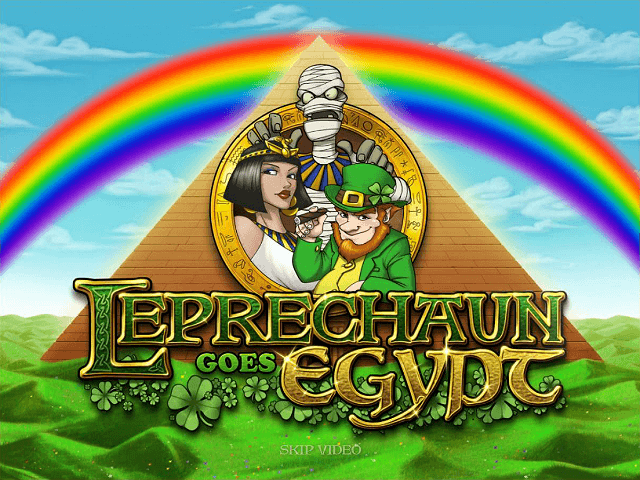 Play Leprechaun Goes Egypt for Real Money! 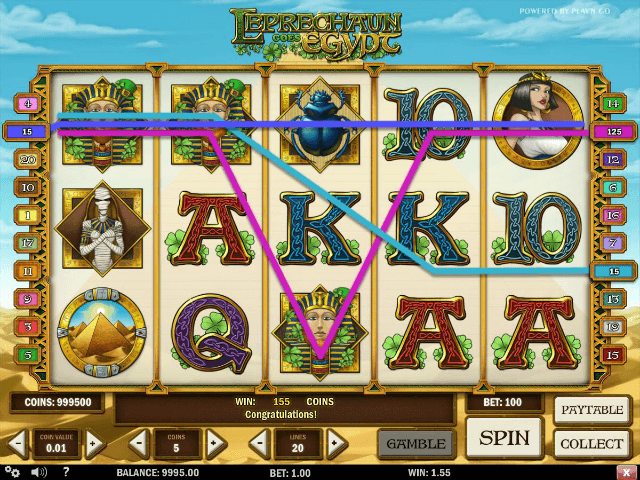 Getting your stake amount correct in any slot game is the key to reaping it's full potential. 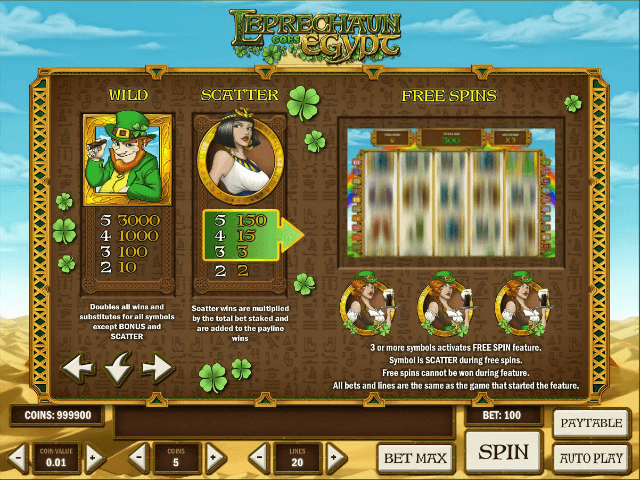 Fortunately, Leprechaun Goes Egypt online slot is a title that allows you to choose exactly how much you wager per spin. First up is the coin value, which can be edited to anything from 001 to 1.00 per spin. Next, select the number of coins you wish to play per spin, which will be between one and five. Finally, we have the payline count. This can be reduced from the standard 20 as you see fit. Put all of these three ingredients together and you can dictate exactly how much of your bankroll you wish to dedicate to each spin. To quicken the process, you can use the ‘autoplay’ feature to set your wager amount and how many spins you wish to play, before simply sitting back and watching the action unfold. There are three additional symbols here that will have you river-dancing all the way home if you can land them. The wild is the leprechaun himself, who not only doubles all wins he appears in, but also substitutes for all other symbols apart from the bonus and scatter. That scatter is Cleopatra, who has been given something of an Irish makeover courtesy of a green hat and pint of Guinness. Three or more of this beauty on your reels triggers the free spins bonus. At this point you will be presented with one of three possibilities: 15 free spins with a 2x multiplier, 10 free spins with a 3x multiplier or 5 free spins backed by a 6x multiplier. Last, but by no means least, is the bonus symbol. Three of these trigger the bonus game where a top prize of 500x your stake awaits! Simply pick a sarcophagus and hope Cleopatra awaits you, rather than the unlucky mummy who ends the game immediately. Share this Leprechaun Goes Egypt Review today! 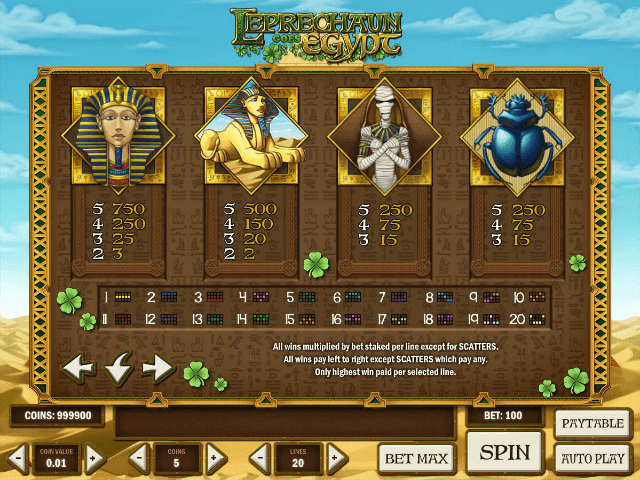 If you like Leprechaun Goes Egypt, you'll love these slot titles too!